At MobileHCI this year in Vienna I presented work which was conducted in cooperation with my Master student Perihan Gad from the German University in Cairo. A number of research projects had investigated possibles ways to enlarge the input vector for touchscreens. One viable option is to use the finger orientation as additional input dimensions. 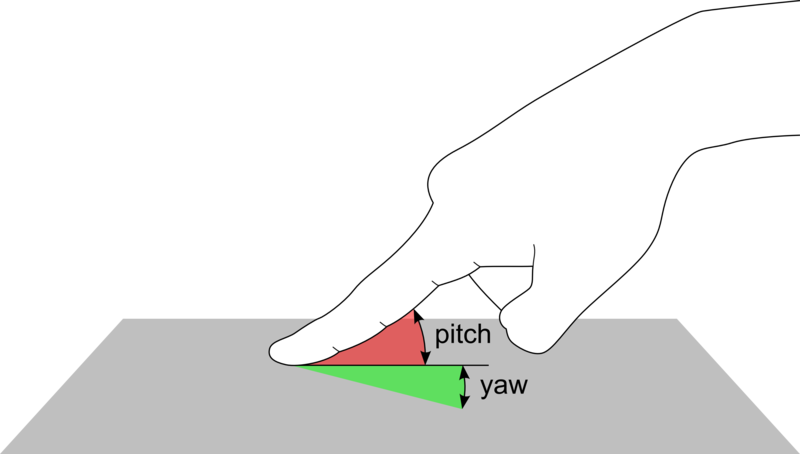 In our case, we investigated pitch and yaw as two additional dimensions. In our study, we investigated the ergonomic constraints while performing different pitch and yaw orientations. Therefore we systematically varied the full pitch and yaw range and asked participants how feasible it was to perform the finger orientation. We varied the input orientations using 4 different pitch and 16 different yaw angles. All combinations were performed with the index finger of the left and the right hand. Sven Mayer, Perihan Gad, Katrin Wolf, Paweł W. Woźniak, Niels Henze : Understanding the Ergonomic Constraints in Designing for Touch Surfaces. In: Proceedings of the 19th International Conference on Human-Computer Interaction with Mobile Devices and Services, pp. 9, ACM, Vienna, Austria, 2017, ISBN: 978-1-4503-5075-4, (Honourable Mention Award).